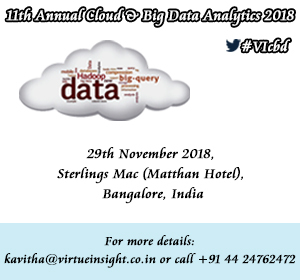 We are pleased to announce "11th Annual Cloud & Big Data Analytics 2018", scheduled from 29th November 2018 at Sterlings Mac (Matthan Hotel), Bangalore, India. Location : Sterlings Mac (Matthan Hotel), Bangalore, India. 11th Annual Cloud & Big Data Analytics 2018 focuses on the emerging area of cloud, inspired by some latest advances that concern the infrastructure, operations, and available services through the global network. The data industry is growing fast, and Virtue Insight’s Cloud Conference has grown right along with it. Weve added new sessions and tracks to reflect challenges that have emerged in the data field including Data Security, Data Analytics, AI, Hybrid Cloud, Machine Learning, Digital Transformation and much more. Please find the detailed agenda for the same with this email. Conference Sponsor & Exhibition Stall - Should you wish to Sponsor, Exhibition Stall (Booth) or a paid Speaker Slot are also available. Get more from the event, with a broader scope bringing the whole communications value chain together. Enjoy and make the best out of our dedicated networking time, meet the leading international vendors and xpand your knowledge of the latest business models and strategies in the high-level conference, showcasing the products of tomorrow in the co-located exhibition.